The toss sent Goofy flying through the air like an aerial artist between two swinging trapeze bars. 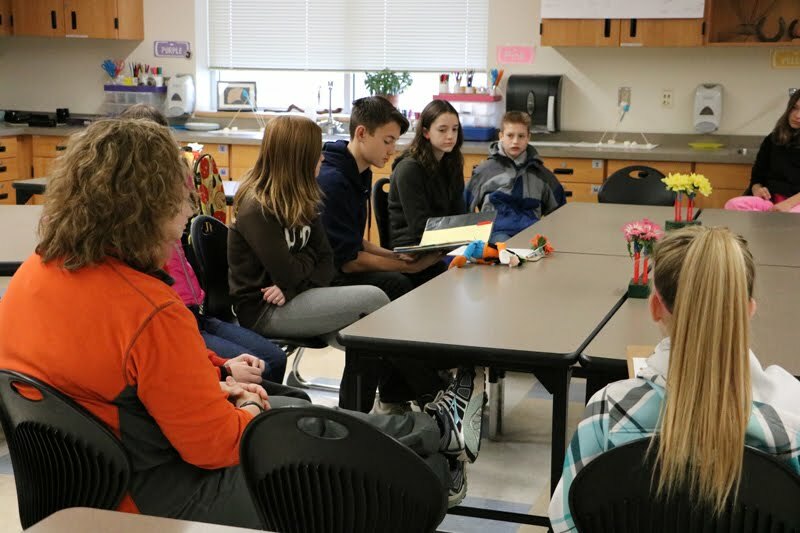 In a move not unlike taking the floor in parliamentary procedure, a student at Daybreak Middle School grabbed the Goofy doll from his flight path and shared her plans for the Thanksgiving holiday. The process continued as Goofy crossed the circle several times, flipping and tumbling back and forth between a dozen or so seventh graders who held the doll as they shared their holiday plans. The practice is a familiar one for the students, who have met once each week during the school year to share their lives with the same group of peers and the same teacher since they were fifth graders. The weekly meetings are part of Daybreak Middle Schools' Dragon Academy, the student-friendly name for a system of Positive Behavioral Intervention and Supports (PBIS) that the school has been implementing for the last eight years to encourage positive behavior and curb disciplinary issues in the student body. "I can go for a week at a time without having a discipline incident," said Kevin Palena, principal of Daybreak Middle School. "We do not have the amount of discipline that one might expect. This is a strong indicator of a positive academic community." The Dragon Academy was so named for the school's mascot, the Daybreak Dragons. The Academy follows the theme of Medieval times, when the mythological creatures were said to have existed. At Daybreak, students are welcomed into the Dragon Academy in fifth grade and placed into one of seven Guilds that they will remain in during the entirety of their middle school years. The Guilds comprise students from each grade level and have their own leadership and crests. Within their Guild, students work on team projects throughout the year and learn leadership skills. For some activities they divide into groups called Power Teams, which combine fifth graders with seventh graders and sixth graders with eighth graders. For other events such as Crusades--also known as school assemblies--the seven Guilds come together about once each month to cover a topic such as respect, teamwork, or change. But at the center of the Dragon Academy, students have small group discussions once each week with their Guild members who are also in their same grade. These discussions are led by the same teacher for the four years that the group is at Daybreak, helping to break down barriers and let the kids build relationships with each other and a teacher who can help them get through challenging times. "The biggest benefit of Dragon Academy is the personal connection the kids make with a single adult for all four years," principal Palena said. "Academy provides a single anchor point for them." The trust, respect and relationships the students have built in their peer groups over the past two and a half years became apparent as the recent Tuesday morning discussion grew personal. "What do you think about the stores opening on Thanksgiving Day and the commercialism of the holiday?" asked Krishna Smith, a seventh grade Guild teacher. "That means families eat dinner and then someone has to go to work rather than be with family." While some students didn't have an opinion on the topic, another said his dad has to work that evening and so their holiday is cut short every year. "The Guild has helped them to make a connection," Smith said. "It gives them someone who they're comfortable with when they need to talk things through." Smith said the peer groups have been effective at reducing disciplinary issues. 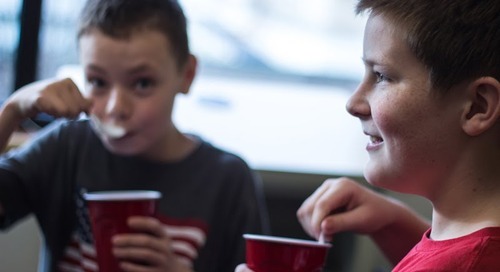 By discussing issues in a neutral way using "what if" scenarios, one student in particular has learned how certain behaviors have been interpreted as bullying by his peers, and he has worked to change his actions. "Each academy class becomes its own little community," Palena said. "Students watch out for each other and it helps them manage and navigate middle school. The Guild system, Power Teams and Crusades all function to build the story of what it means to be a Dragon."